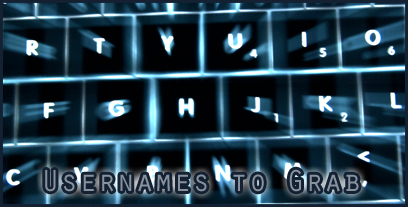 Identity names you should try to grab - Do it now! Time for a short tip: What are the (user)names / identity names that should try to grab as soon as possible? You want to identify yourself all over the net when you have a blog / website, so you should be the only one that's able to use that specified name. But what are the places where you should try to capture a name? Here's a list of a couple of names that you should register at this moment (if you didn't do it already). If you wait, the name could be grabbed by someone else already! Before you read the rest of the article, make sure you already know what you already have in your inventory of names. If you have all points stated below checked, you're doing fine. If not, you should really try to grab those names before someone else does. I try to identify myself with Marcofolio.net, although it doesn't work all the time. You want to brand your name, so that once someone enters your name on a search engine, you'll be the only one that will be found. Here are a couple of tips. Here's a pretty obvious one for you: You should try to grab your (full) name as a .com domainname. How you register the name is up to you: If your name is "David Davidson", you could try to register ddavidson.com, davidd.com, daviddavidson.com etc. Even if you're not going to use it right now, it can always be useful. Another common thing is to register for your family: family-davidson.com. A great place where you can place your Family Tree. When you have found your .com domain, try to grab the name in all other generic top-level domains: .biz, .info, .name, .net, .org and .pro. Maybe all of them is a little bit too much, but at least go for .net and .org before others take them. Collis Ta'eed and his Envato Network have a great example of registering "Sister domains" with the TUTS family and their Marketplaces. PSDTUTS, AUDIOTUTS, VECTORTUS and NETTUTS are all part of the same family as you can see in their names. This makes it really recognizable - Grab those names! Most (big) mail services are free these days (GMail, Hotmail, Yahoo! Mail etc.) and have the ability to manage your domain mail (GMail is especially good at this). It's pretty obvious that you want to have the "domainname@gmail.com" name. If you don't have it, try to register it now. Even if you're not going to use it directly, it's free, so just park it. Although Twitter is pretty new, many users on the Internet are now using it; Following other tweople in the Twitterverse. I'm a Twitter user myself too. This one is like the mail service: Try to take your domainname as your username (Like I did with "marcofolio"). This will really help you with Internet identification and branding. You can even automatically add your RSS Feed to your Twitter account if you have TwitterFeed set up. FlickR, Digg, StumbleUpon, Reddit etc. are communities with loads of people where you can share things that you like. Keeping in mind that you want to let people now your identity, you should try to grab your username there too. You could use your domainname to do this. Feedburner (a.k.a. Google Feedproxy) is an awesome way to manage your feeds. I've mentioned the service several times before. When you start to blog on your site, Feedburner is a great service. Of course you cant your domain name to be placed in the URL, just like with mine: http://feeds.feedburner.com/marcofolio. This really helps with branding on the Internet. Since a couple of years, a domain name can exist only of numbers too. To maximize your identity online, you can try to take your birthdaydate as a .com domain: When born on the 8th of February 1988, you could buy 821988.com, 08021988.com, 19880208.com etc. When you're lucky, a very famous and rich person is born on the same date and wants to buy that domain later. If you're not, you still have a great domain name in your arsenal. I'm pretty sure you try hard to grab a domain name that is easy recognizable, easy to remember and (almost) can't be misspelled. Still, your visitors are (and forever will be) humans that can make mistakes. If you really want to lock your identity online, you should grab "Look-a-like" domains: This will cover misspelled domain names. Google also owns the domains Googel, Gooogle and even Gooooogle. Talk about branding! Did I miss something? Are there any other kinds of names that you need to grab as soon as possible? Please share!